American Tank Co., Inc. is pleased to offer the PW 9000 Pure Water Ozone Water Treatment System. 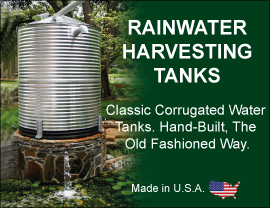 This system is designed for use with any home water supply which utilizes a water storage tank. Sources of water may include wells, springs, lakes, etc. The PW 9000 utilizes the same Ozone Water Purification Technology used by municipal water companies throughout the world. This State of the Art system assures you the highest quality water yet requires very little maintenance. Please note: The PW 9000 uses no Chemicals, Salt, or Activated Carbon. The PW 9000 ozone water system uses an Ozone Generator in combination with an air pump to continuously aerate your water storage tank with Ozone Saturated Bubbles that oxidize and kill many of the impurities in your water. These bubbles also provide the pumping action to constantly circulate and filter the entire contents of your holding tank at the rate of approx 10 GPM (over 14,000 gallons per day). The water produced is refreshing and delicious. You will have high quality water throughout your home and land for all your water needs: Showering, Laundering, Dish Washing, Cooking, Plant Watering, etc. All of this and the system costs only pennies a day to operate. (Typically about $3-$5 per month). Call toll free today: 1-877-655-1100 to speak to one of our friendly and knowledgeable Ozone Water Treatment Specialists. Ozone water treatment is oen of the best filtration methods to insure your drinking water is free from harmful chemicals. Our ozone water water systems provide you and your family with fresh tasting water that not only tastes clean, but is clean.